Mortgage Rates Decline To Record Lows...Again. Will Rates Fall to 0%? Why do I feel a sense of Deja Vu every time I write a post on this topic? Maybe because mortgage rates have been in a state of free-fall for the last year, and every week seems to offer the same story of new record lows. This week was no exception, as Freddie Mac reported that the average 30-year fixed rate is now at 4.19% and the average 15-year fixed rate was 3.62%. Both rates have declined nearly 20 basis points over the last month. Interestingly, points (which are paid upfront and used to buy down the mortgage rate) have been rising, from .6 earlier this year to .8 today. That implies that the actual decline in interest rates is less than Freddie Mac would have you believe. It’s interesting that while lenders are willing to pass along low rates to borrowers, they are taking a larger cut for themselves in the form of points. In practice, this means that your APR will be higher than the mortgage rate quoted to you be your lender. Furthermore, the lowest rates are only available to the most creditworthy borrowers. 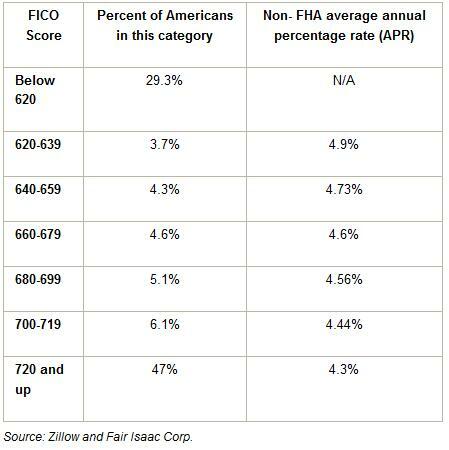 Those with FICO credit scores of 720 or above can expect to pay around 4.3%, according to a Zillow survey of mortgage data. That’s great for the 47% of borrowers that fall into this category, but what about everyone else? As you would expect, (prime) borrowers with even slightly lower credit scores are offered interest rates that are more than .5% higher than their 720+ counterparts. Unfortunately, those with scores below 620 probably won’t even receive an offer. Regardless of how you slice the data, however, rates are extremely low across the board. One columnist recently wondered aloud whether they could fall even lower, perhaps all the way to 0%. It seems impossible, but then again no one thought that rates would be this low only a couple years after the housing bubble burst. She speculated that, “Rates at or near 0% could bring more first-time home buyers out of hiding to seek out extremely favorable financing for a house.” Even ignoring the fact that no sane lender would ever offer 0% mortgage financing, it seems unlikely that a significant number of potential borrowers are still biding their time in anticipation of still-lower rates, given that government home-buying incentives have expired and lending standards are being tightened. Already, 80% of mortgages are actually refinancings of existing mortgages. If rates decline further, it seems like it will only a trigger a new round of refinancing (as those who refinanced at 5% repeat the process). At this point, I don’t really think it’s a meaningful exercise to ponder whether rates will fall farther. If you asked me for my honest opinion, I would say that an expansion of the Federal Reserve Bank’s Quantitative Easing program (in the form of additional purchases of Mortgage-Backed Securities) could drive rates even lower. Still, you have to wonder how much it would matter if rates fell to 3.5%, for example. For the purchase of a $200,000 home, this would lower one’s monthly mortgage payment by about $100. Don’t get me wrong- one would certainly be grateful for the savings, but for the majority of people, it wouldn’t be enough to make an otherwise unaffordable mortgage affordable. As for how lower rates are affecting the housing market and housing prices, that’s the topic of my next post.